Dr. Chen received his B. Sc. and M. Sc. Degrees from Northwest Normal University, Lanzhou, China in 1986 and 1989, respectively, and Ph. D. degree from Essen University, Germany in 1999. From 1999 to 2007, he had postdoc training in University of Goettingen, Germany. Since 1999, his research interests have been focused on the understanding of molecular mechanisms of liver and pancreas development. The main focus of the Chen laboratory is to understand molecular mechanisms of pancreas development, which is critical for rational approaches to generate functional pancreatic beta cells. We use frog and mouse embryos to investigate the early process from endoderm patterning to the formation of the pancreatic buds. 1. Li, X., Han, D., Kam, R. K. T., Guo, X., Chen, M., Yang, Y., Zhao, H., and Chen, Y. 2010. Developmental expression of sideroflexin genes in Xenopus embryos. Developmental Dynamics 239, 2742–2747. 2. Wen, L., Yang, Y., Wang, Y., Xu, A., Wu, D., Chen, Y. 2010. Appl1 is essential for the survival of Xenopus pancreas, duodenum, and stomach progenitor cells. Developmental Dynamics 239, 2198-2207. 3. Yang, J., Cai, J., Zhang, Y., Wang, X., Li, W., Xu, J., Li, F., Guo, X., Deng, K., Zhong, M., Chen, Y., Lai, L., Pei, D., and Esteban, M.A. 2010. Induced pluripotent stem cells can be used to model the genomic imprinting disorder Prader-Willi syndrome.J Biol Chem. 285，40303-40311. 4. Wen, L., Liu, J., Chen, Y., and Wu, D. 2010. Identification and preliminary functional analysis of alternative splicing of Siah1 in Xenopus laevis. Biochem Biophys Res Commun. 396, 419-424. 5. 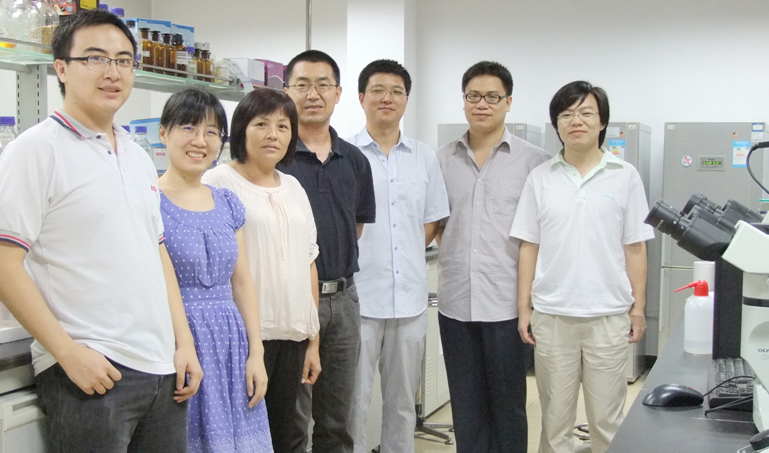 Liu, Y, Chen, X.Q., Liang, H.X., Zhang, F.X., Zhang, B., Jin, J., Chen, Y., Cheng, Y.X., and Zhou, G.B. 2011. Small compound 6-o-angeloylplenolin induces mitotic arrest and exhibits therapeutic potentials in multiple myeloma. PLoS One 6, e21930. 6. Kam, R. K. T., Chen, Y., Chan, S.O., Wood Yee Chan, W. Y., Dawid, I., and Zhao, H. 2010. Developmental expression of Xenopus short-chain dehydrogenase/reductase 3. International Journal of Developmental Biology 54, 1355-1360. 7. Pan, F.C., Chen, Y., Bayha, E., and Pieler, T. 2007. Retinoic acid patterning of dorsal pre-pancreatic endoderm during gastrulation involves interaction with BMP signalling. Mechanisms of Development 124，518-531. 8. Cimica, V., Batusic, D., Haralanova-Ilieva, B., Chen, Y., Hollemann, T., Pieler, T., Ramadori, G. 2007. Serial analysis of gene expression (SAGE) in rat liver regeneration. Biochem Biophys Res Commun. 360, 545-552. 9. Pan, F.C., Chen, Y., Loeber, J., Henningfeld, K., and Pieler, T. 2006. I-SceI meganuclease-mediated transgenesis in Xenopus. Developmental Dynamics 235, 247-252. 10. Afelik, S., Chen, Y. and Pieler, T. 2006. Combined ectopic expression of Pdx1 and Ptf1a/p48 results in the stable conversion of posterior endoderm into endocrine and exocrine pancreatic tissue. Genes & Development 20, 1441-1446.